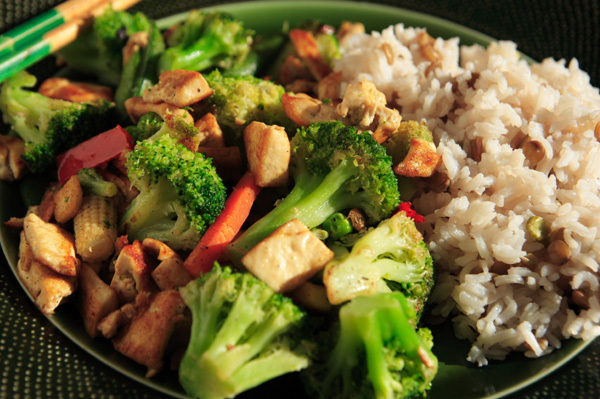 Make a great stir fry – on the grill or in the oven – to go along with any meal! Center Mann’s California Stir Fry and garlic on sheet of aluminum foil. Combine chicken broth, Cajun seasoning and vegetable oil; drizzle mixture over vegetables. Bring up foil sides. Double fold top and ends to seal making one large packet, leaving room for heat circulation inside. Preheat grill to medium-high or preheat oven to 450 degrees F.
For Gas Grill: place foil packet over medium-high heat, cover grill and cook for 10-12 minutes or until tender. For Charcoal Grill: place foil packet over medium-high heat and cook uncovered for 20-25 minutes or until tender. For Oven: Place foil packet on a cookie sheet and bake for 20-25 minutes or until tender. Open foil packet carefully to allow steam to escape. Serve hot.